This method is helpful when changing the TVD of all the layers (Network, Event, and Calibration Point) in an MXD at once. Start ArcMap and open your MXD containing the LRS layers. Click the Set Date Filter button on the Roads and Highways toolbar. You can hover over the Set Date Filter tool to see the current TVD setting. The Set Date Filter dialog box appears. The list of the LRS layers present in the .mxd appears with their individual TVDs. 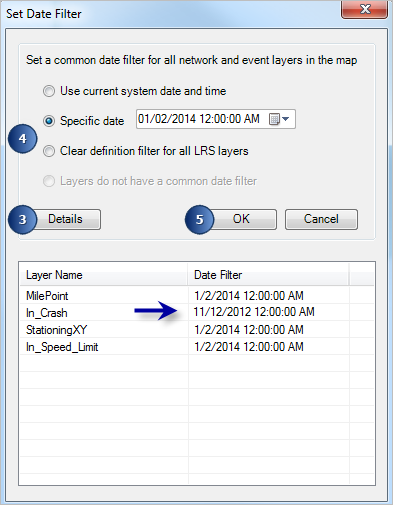 You have two choices to set a common date filter for all the LRS layers present in the map. Choose the Use current system date and time option to set the TVD from the system's current date and time. Choose the Specific date option to specify a TVD. The selected TVD is set for all the LRS layers present in the .mxd and the Set Date Filter dialog box disappears. To clear the TVD from the LRS layers, click Clear definition filter for all LRS layers. This option removes all definition filters from the LRS layers including networks, intersections, and calibration points. When using temporal data with time-enabled ArcGIS tools, such as the time slider, all TVD definition queries must be removed from your layers prior to using these tools. When using temporal data with the Event Editor, all TVD definition queries must be removed from your layers prior to publishing your map service. To learn more about deploying Event Editor, see the Event Editor deployment guide . You can change the TVD for each individual layer in your map by opening the Layer Properties dialog box and clicking the ALRS tab. Add LRS Networks and LRS event layers to your map. Right-click the LRS Network or event layer in the table of contents and click Properties. Click the ALRS tab on the Layer Properties dialog box. 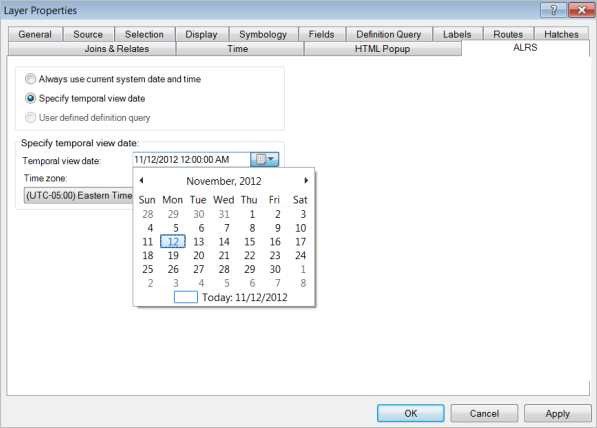 Click the Specify temporal view date option. Click the Temporal view date calendar and choose a TVD.